Now that our friends at Kansas Pregame have released and distributed their 2015 edition, we can officially announce that Everett Royer has been awarded the Grand Prize for the 2014 Kpreps Friday Night Photo Contest. 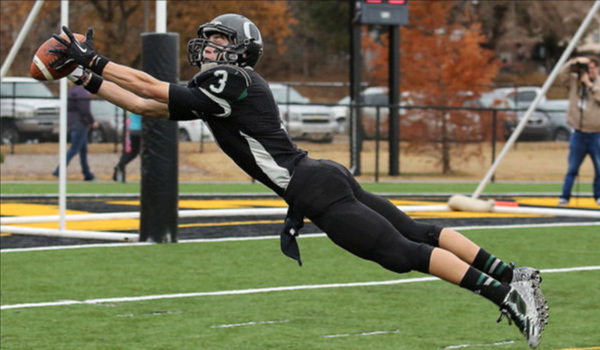 Royer’s winning photo captures Central Plains wide receiver Layne Bieberle’s incredible, diving touchdown reception to open the scoring in the 2014 8-Man, Division I state football championship game. Bieberle had seven receptions for 186 yards and scored three touchdowns as the Oilers claimed the title with a 42-30 win over Hanover. Royer, who was also named the grand prize winner in 2010, wins $500 cash for his 2014 winning photograph. The winning photo was announced and featured in the 2015 edition of Kansas Pregame Magazine.